A quaint little town, quiet and picturesque was what Newtown was for as long as people can remember. It was a delightful community where everybody knew each other, grew up alongside one another, played as neighbors in their yards and looked after each other’s children. It was filled with carefree joy and holiday traditions; that was the peaceful illusion that filled this small town in Connecticut for many years. This illusion would be tragically shattered on Dec. 14, 2012 when the lives of 26 individuals were claimed. No one expected it. Who could have seen it coming? What followed for the families and residents of Newtown in the coming months? 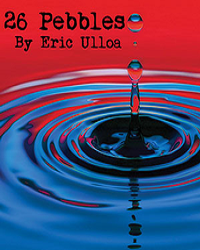 “26 Pebbles,” a play by Eric Ulloa, takes accounts from residents of Newtown and explores gun violence and just how this horrific event took this small town and turned their world upside down. Throughout the play, each of the actors transforms into various personas to recount the stories of that fateful December day, and the ripple effect which ensued in the time after. Parents were horrified to learn that they may never hold their children again, a priest and rabbi attempted to draw meaning from this senseless act, while countless members of the town went through what happened and what they could have missed. From the initial description of Newtown, audience members are drawn in. They are immediately seeing the love of this community, from those who have traveled from afar, to ones who spent their whole lives within its peaceful hold. Emotion and tragedy brought them together, but hope and courage are what kept them going. In the face of so much hate and pain, those who inhabited this once quiet community had to navigate their way through the disturbance brought on by the media storm, which was so invasive that they were practically stripped of the right to grieve in peace. They racked their brains for answers, wondering why the shooter would have done this, and if those around him were at all to blame for this tragic fate. Did he “slip through the cracks?” If he had been put on a different path, would they not have come to face with such great horror? Tragedy opens our eyes to infinite questions and ignites a passion, a desire for change. Accounts in the show recall the overwhelming amounts of donations made to the community. Hundreds and thousands of letters, teddy bears sent for the traumatized children, so many volunteers that the community did not know what to do with them. They wound up donating to places including India, Haiti, Children and Women’s hospitals and even victims of Hurricane Sandy. They took the kindness that was shown to them and continued to spread it. What is communicated so well in this play is that in the wake of all the hate and pain that surrounded them, this community came together, stronger and more compassionate than ever before. They learned the strength in themselves and the reliance of the children who had to carry on after what they had been through. The cast did a phenomenal job, conveying the heartbreaking emotion, pouring every ounce of power they had into the roles they played. They flawlessly transferred from character to character in such a way they left the audience in awe. Through the process, even they had their eyes opened. “We did research for each character and we had to learn the different perspectives,” said cast member Angelina Smith. “That did open all of our eyes a lot, looking at different peoples opinions on this whole thing.”. “26 pebbles” played nine performances from Nov. 13-18 at William Paterson’s Black Box theatre.